There are a few great 2019 Chevy vehicles to look at. 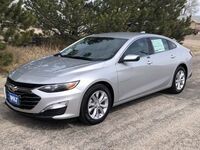 Among them are 2 outstanding sedans; the 2019 Chevrolet Malibu, and the 2019 Chevrolet Cruze. But what one is the right fit for you? We are about to find out as we compare these 2 Chevy vehicles to each other to see which one pulls ahead of the competition. In order to do this, we’ll be comparing some comfort and convenience features that each vehicle offers. Hopefully by the end of this, you’ll have a better understanding of what features the Malibu and the Cruze have, and what vehicle will suit your needs best. If you have any questions at the end, then please don’t hesitate to ask! Wolf Auto Center will be happy to tell you more about these vehicles. Now, let’s take a look at what features you can expect to see on these 2 great sedans! At first glance, the Chevrolet Cruze has more trims than the Malibu. However, 3 of those trims are hatchbacks. This is somewhat similar to the Malibu, since one of its trims is a hybrid. This means that if you are looking for a traditional sedan, you’d actually have 5 options for the Malibu, and 4 on the Cruze. The Malibu has a slightly better engine than the Cruze. It has a 1.5L Turbo engine, as opposed to the 1.4L Turbo engine that is on the Chevy Cruze. The Malibu also has more trims that offer heated seats, which can be especially helpful to those who travel to colder states more often. Heated seats are standard for the Premier trims of both the Malibu and the Cruze, and both models have this feature available on the the LT trims as well. However, the Chevy Malibu has 1 more trim that has the heated seats. So, if this is a feature is something you are interested in, you might want to check out the Malibu over the Cruze. Looking for the 2019 Malibu or Cruze? Contact us! We are always happy to help you find your future vehicle.